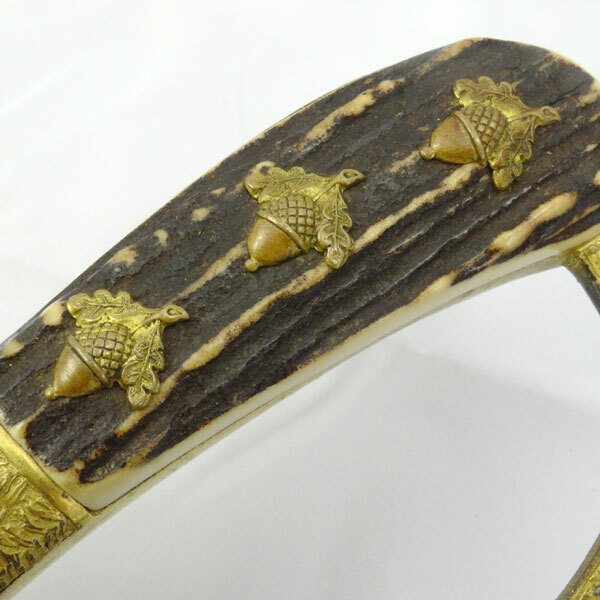 Starting at the grip we see a nice oak leaf pattern surrounding the “D” guard, terminating at the typical hoof design making up the end of the lower portion of the guard. 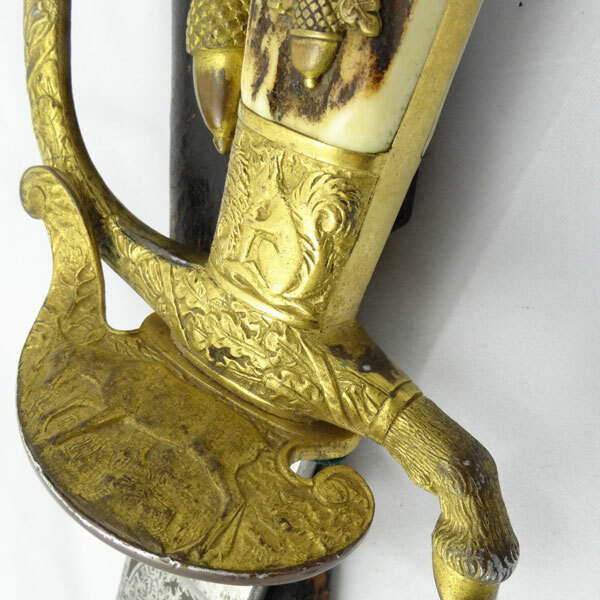 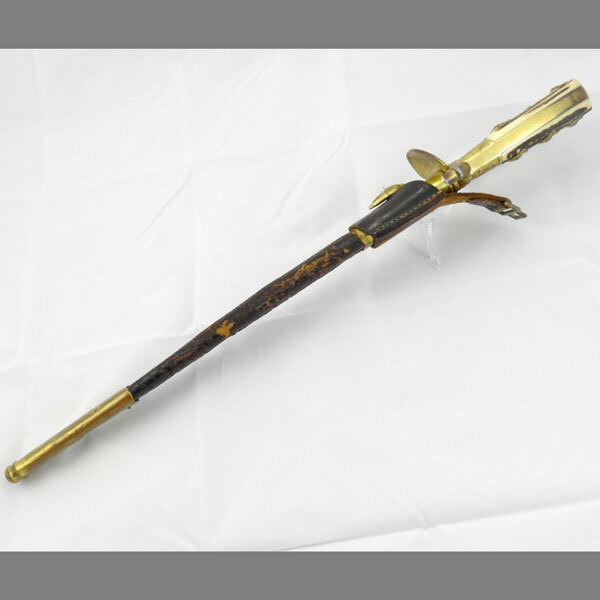 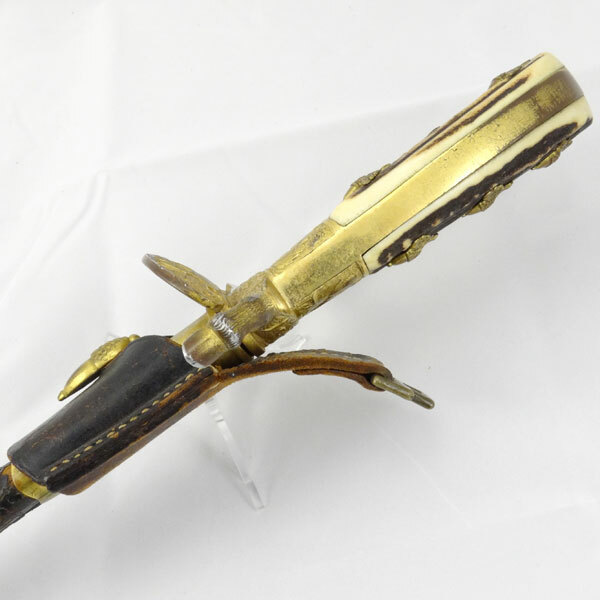 On the front of the grip, just below the stag grip we see the Eickhorn squirrel design nicely embossed into the gilded brass. 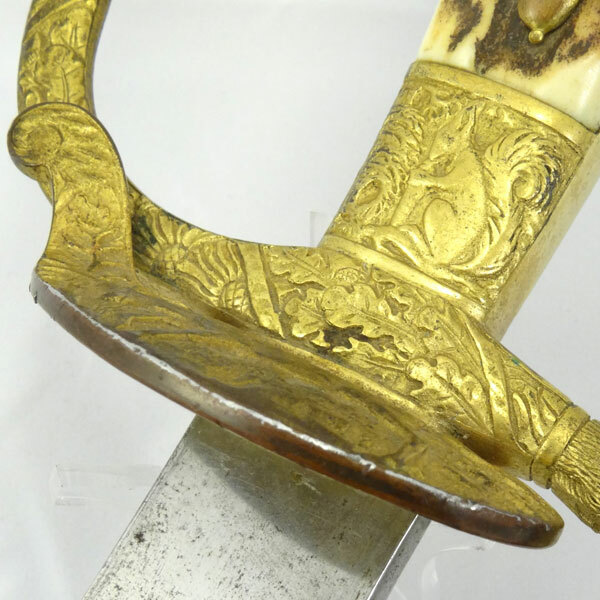 On the reverse is a deer in mid stride. 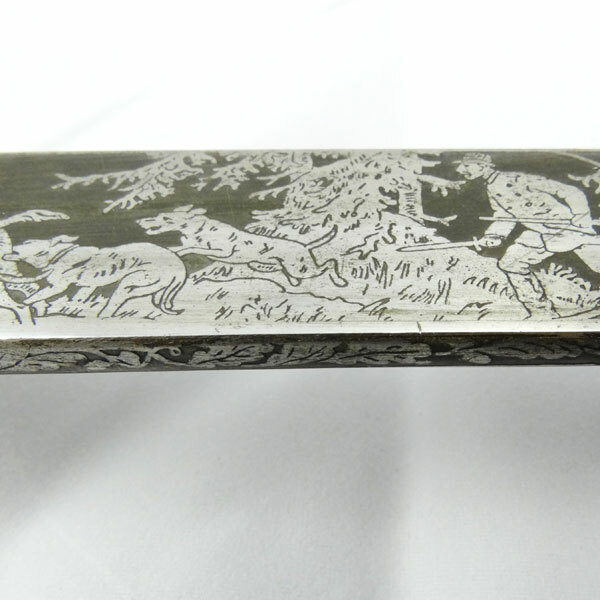 Below the guard is the deluxe clamshell depicting a nice buck scene with nice detail. 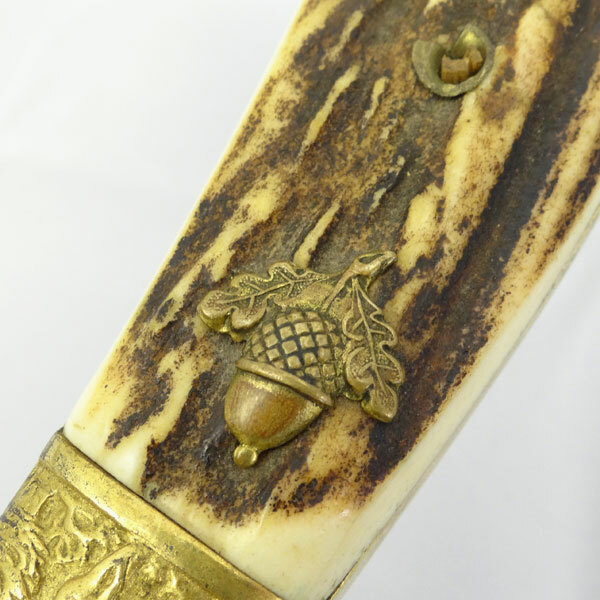 The stag grips are chip-free and aside from the single missing acorn in the middle of the front side, it doesn’t get much better. 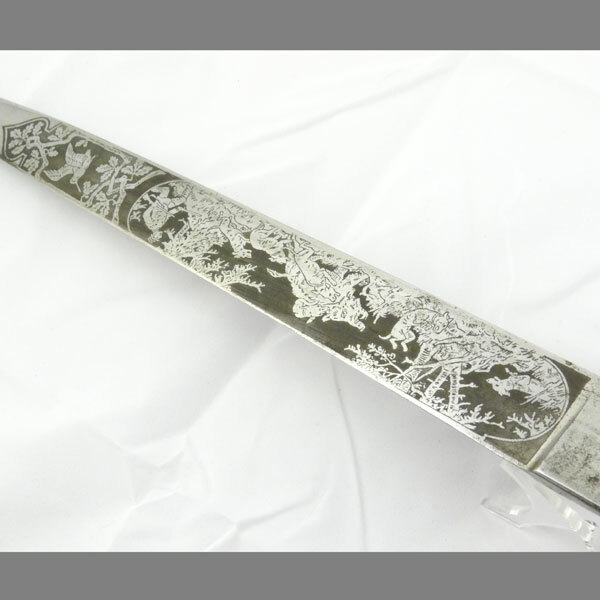 Moving down to the blade we see our normal wear and spotty oxidation from storage and age, but not enough to detract from the beauty of the triple engraved scene. 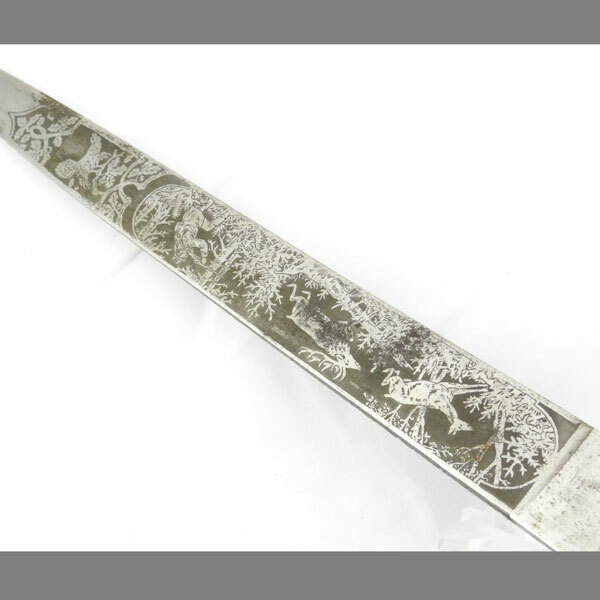 On the front we see two deer (a doe followed by a buck) running from the hunter with his rifle in hand, aiming for the kill. 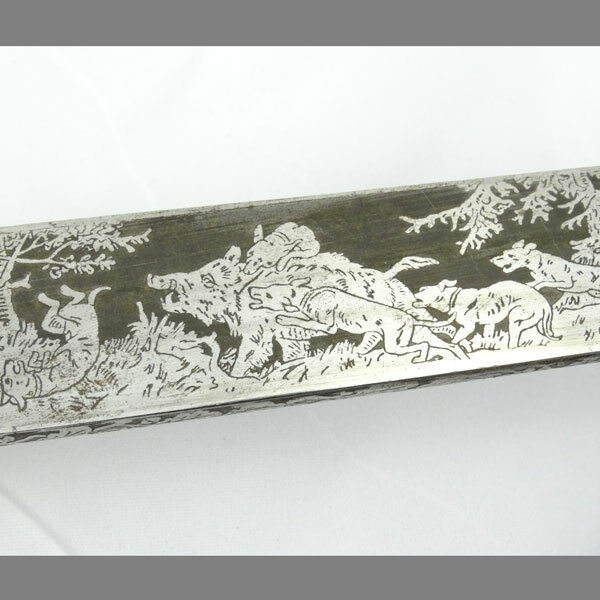 The reverse shows several hunting dogs taking down a wild boar, with the hunter following behind wielding his rifle and hunting cutlass. 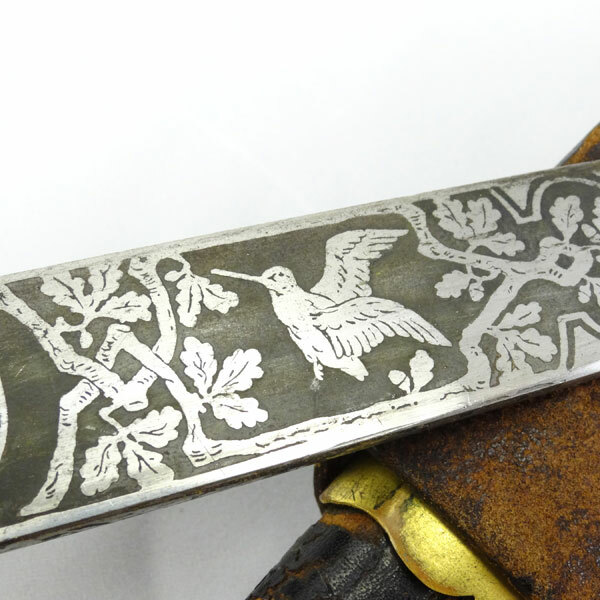 Along the thick spine of the blade is an oak leaf pattern, with alternating acorns and oak leaves. 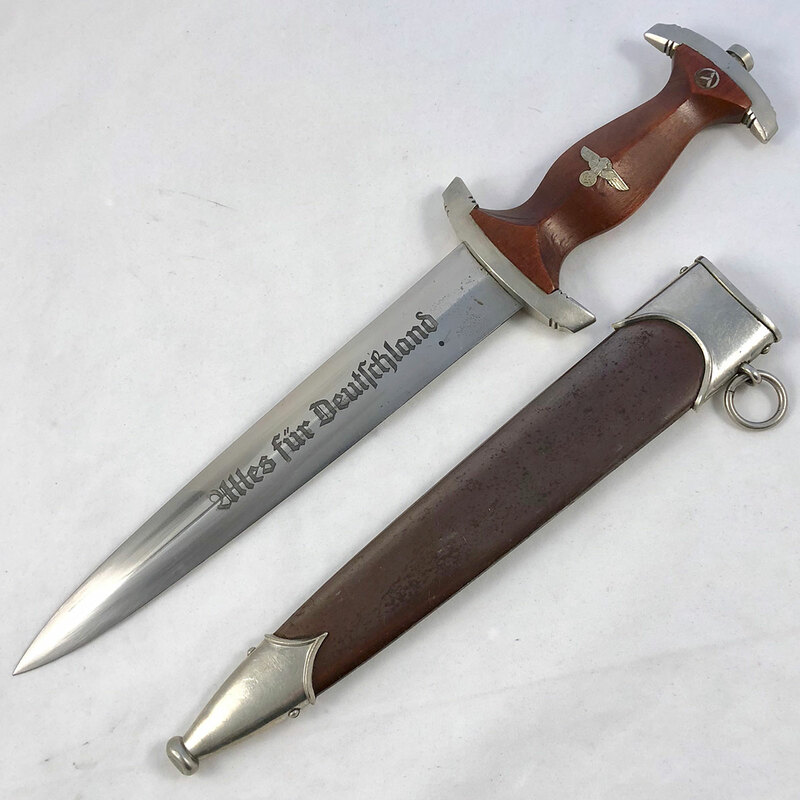 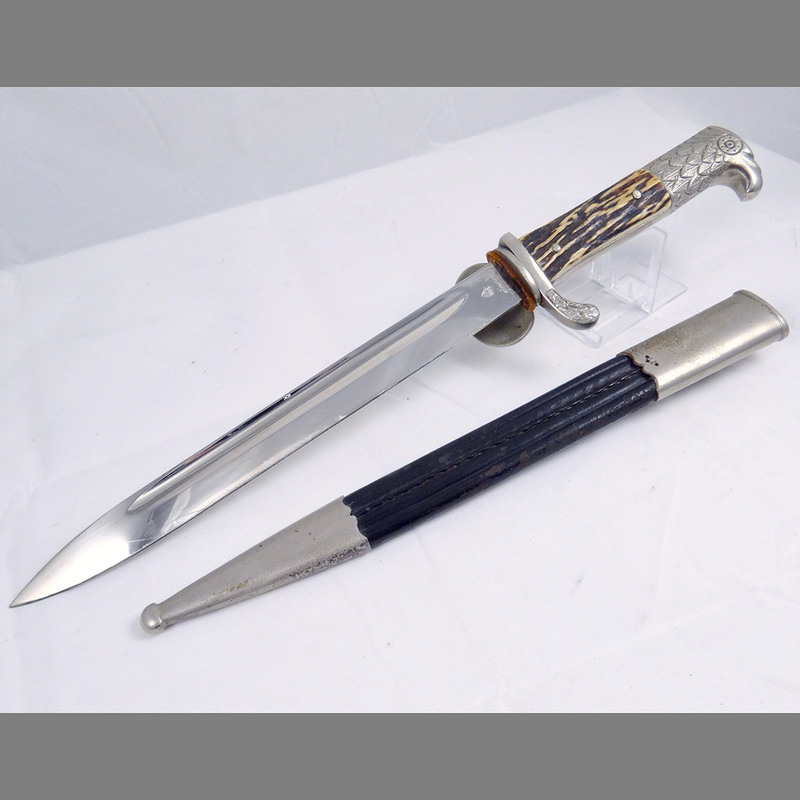 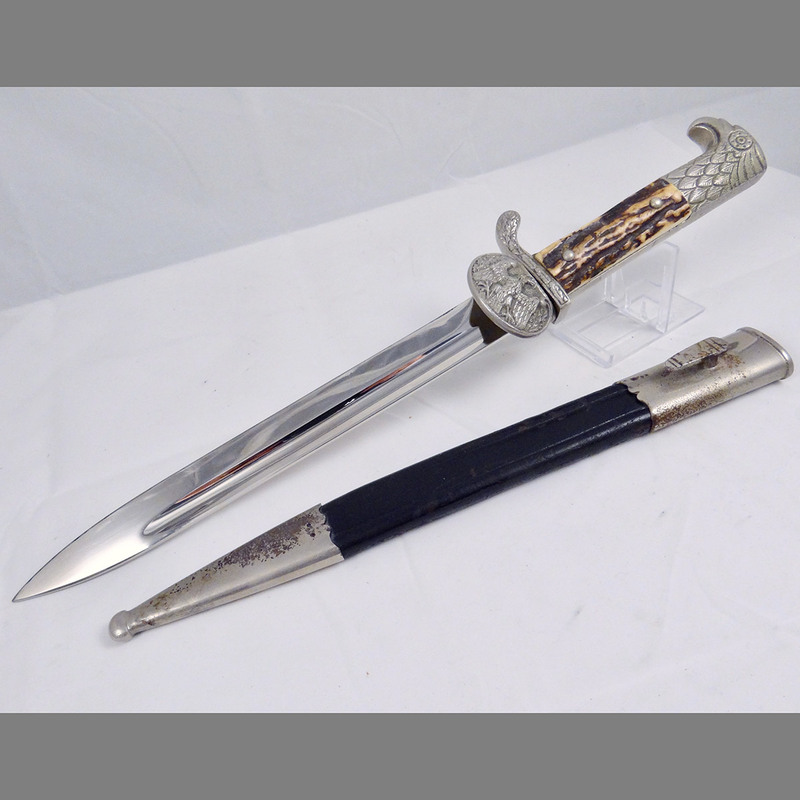 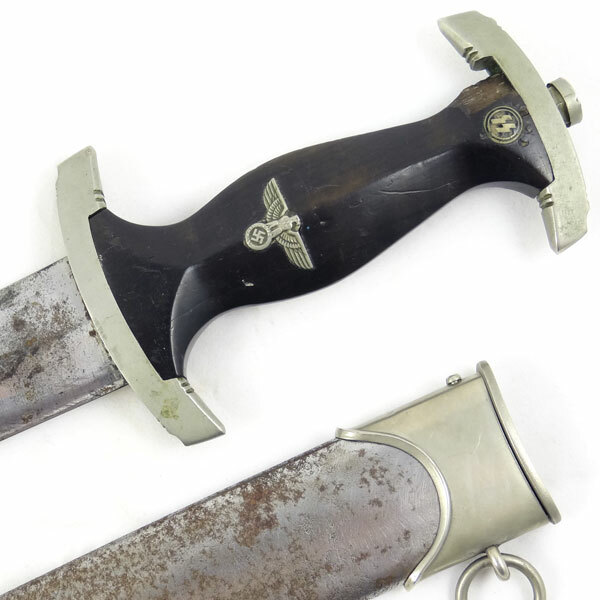 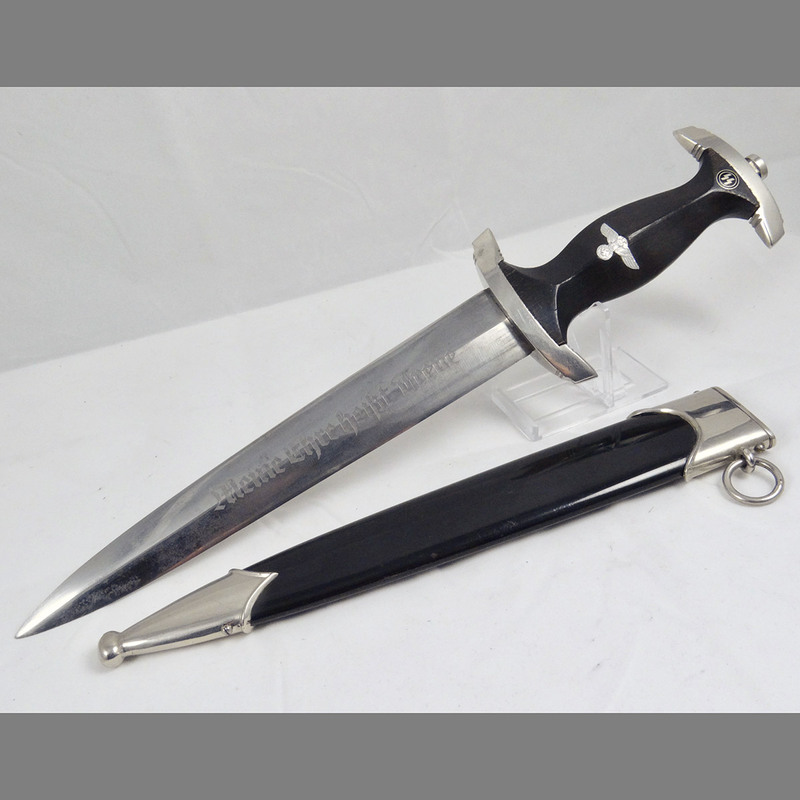 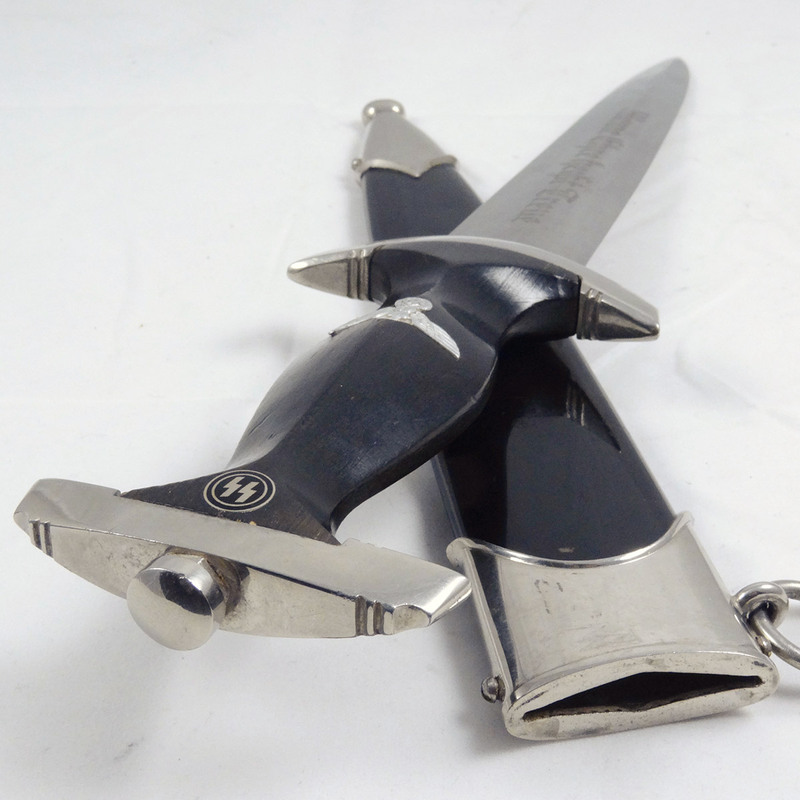 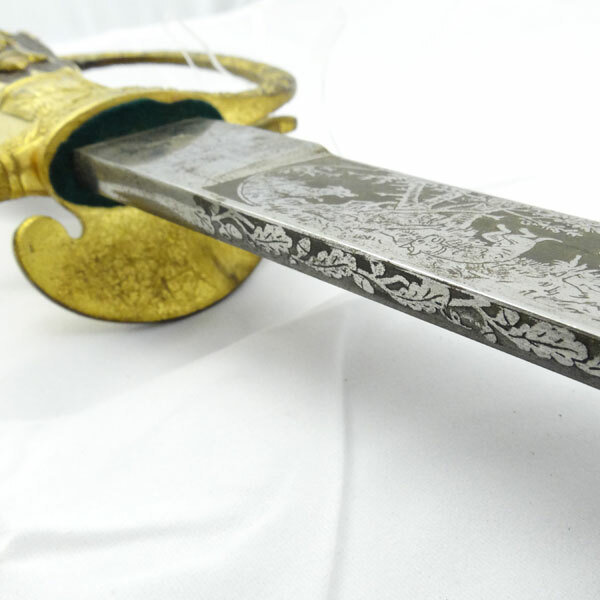 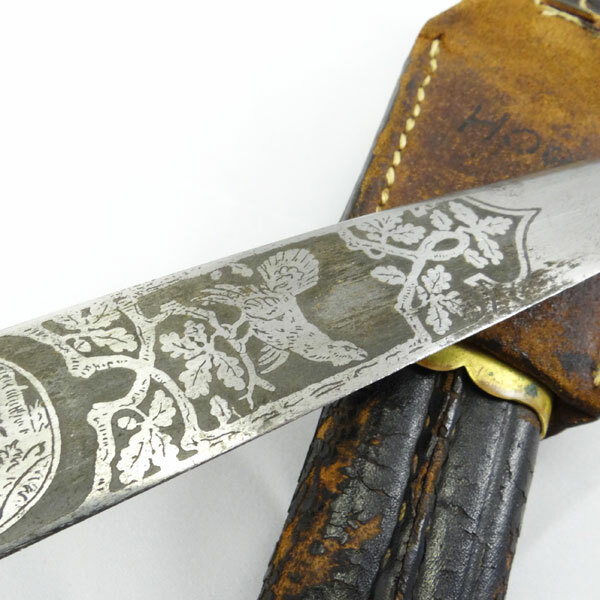 The blade engraving has retained its crisp detail and medium gray background tone, which implies that this blade has not been cleaned, polished or buffed. 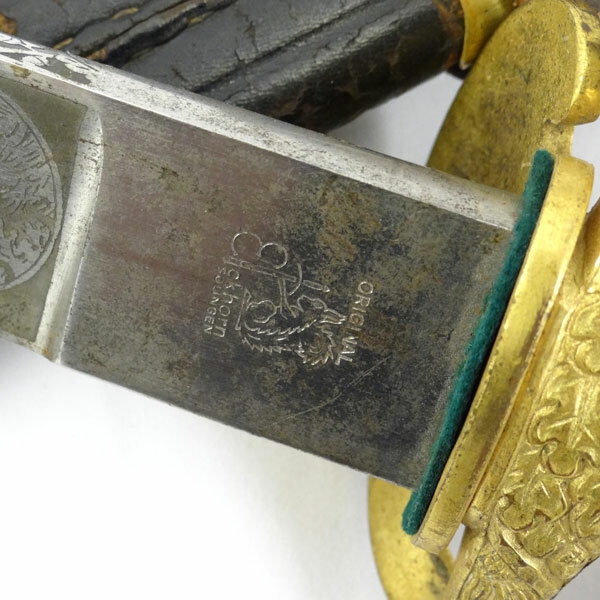 At the base of the blade we see the Eickhorn logo and original green buffer pad. 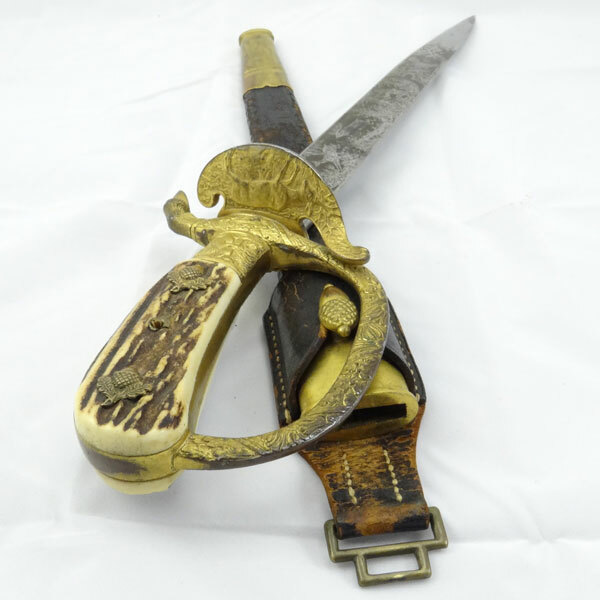 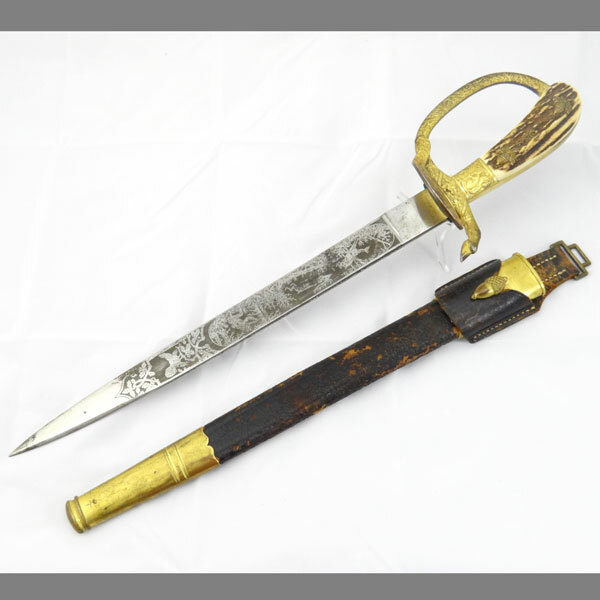 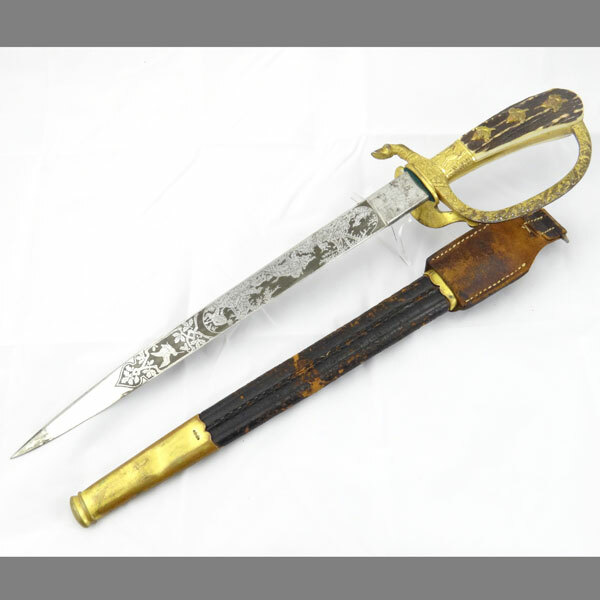 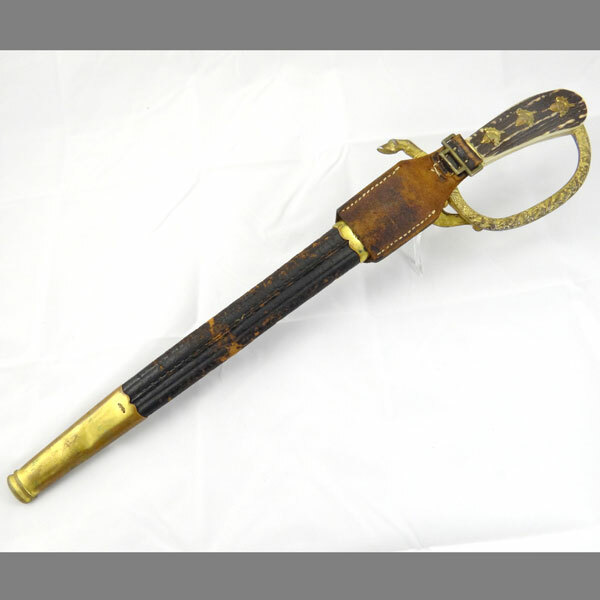 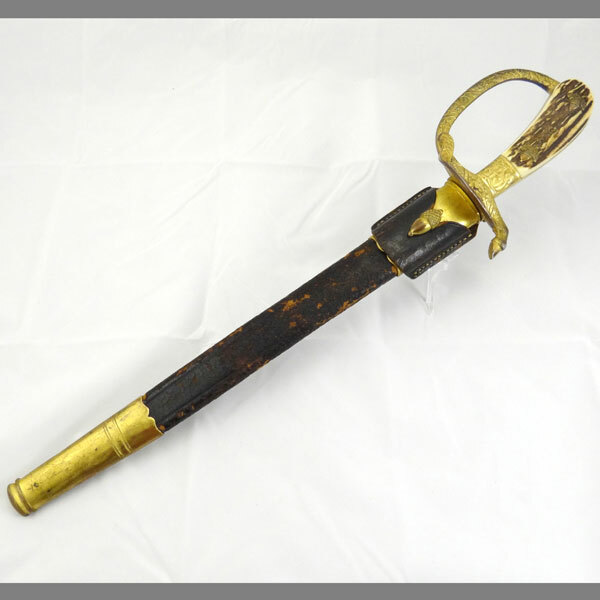 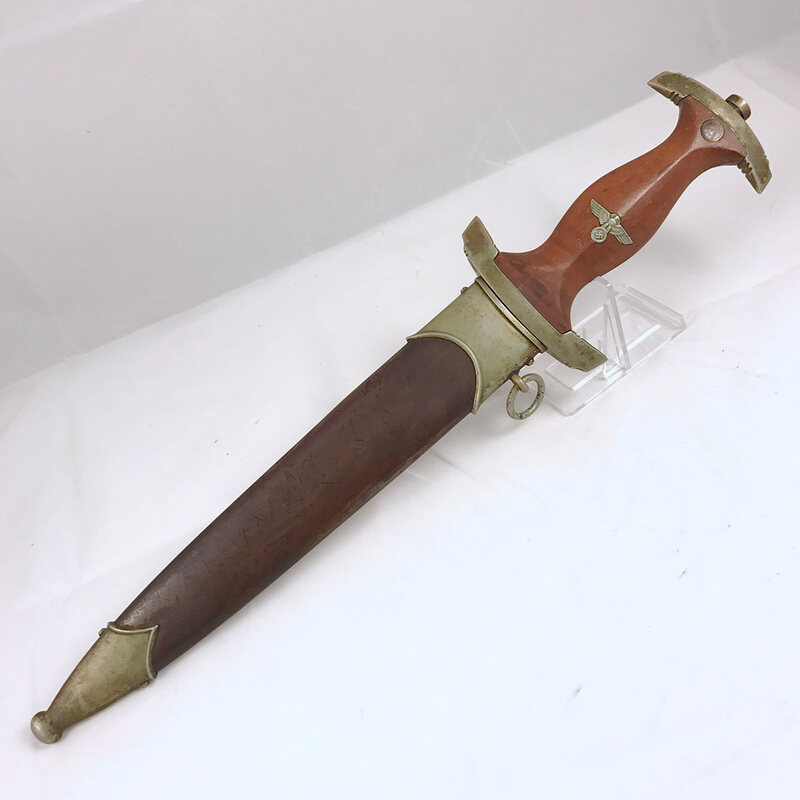 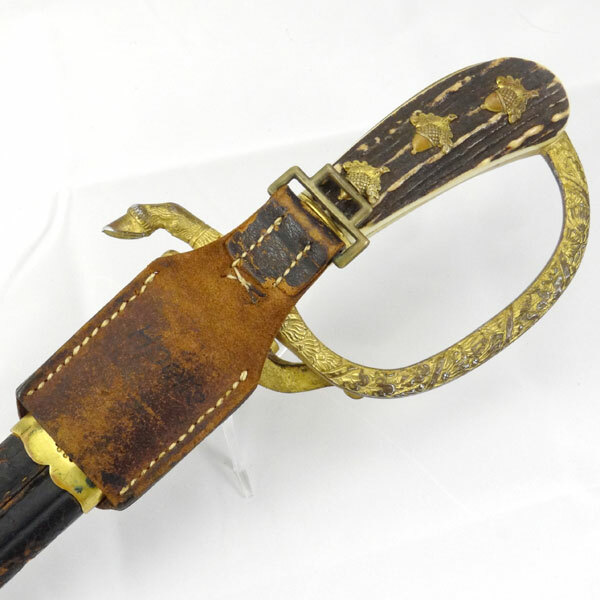 The scabbard on this one has suffered from age, but despite its appearance the leather is rigid and is not flaking. 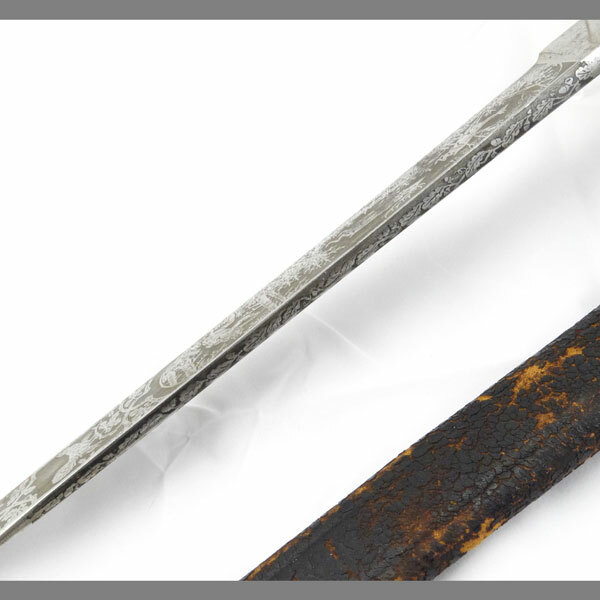 The surface looks worse than it is. 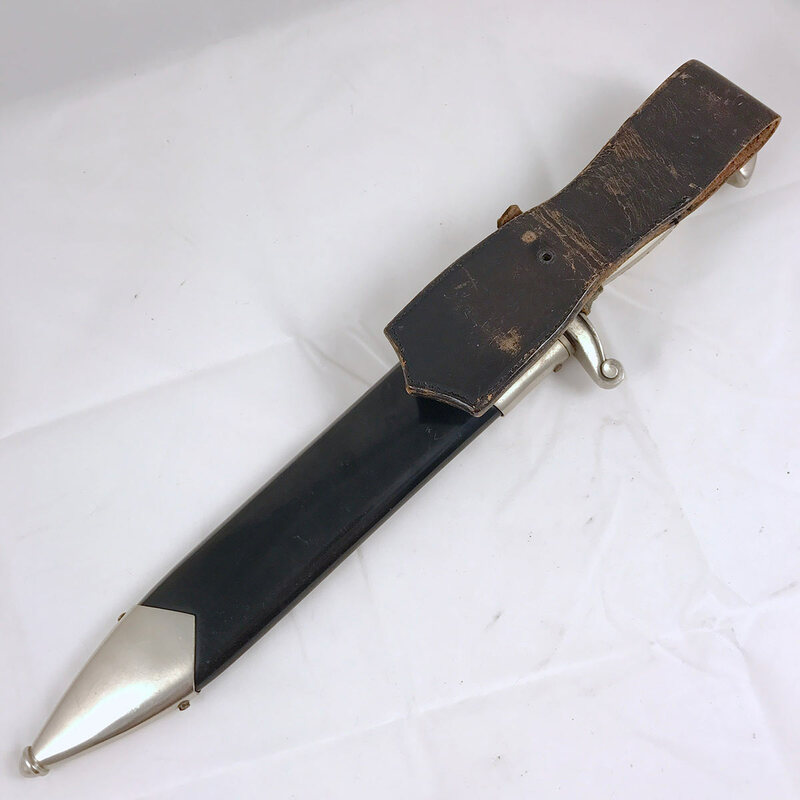 If anything, the look ads to the rustic nature of the piece overall. 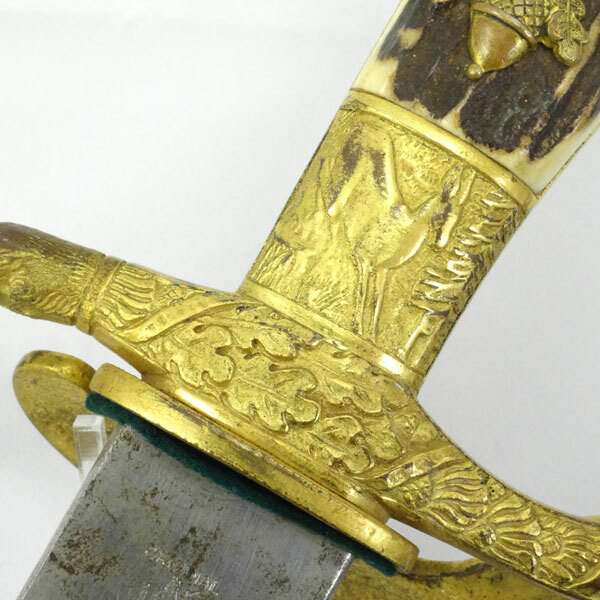 The gilded brass fittings show age and use wear consistent with the grip. 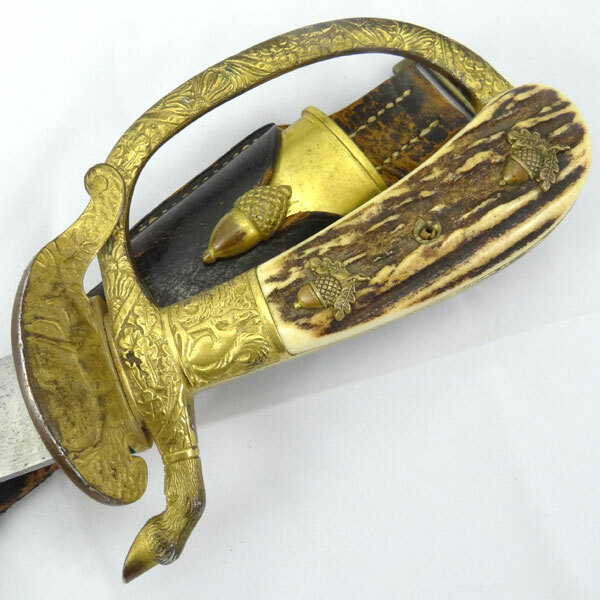 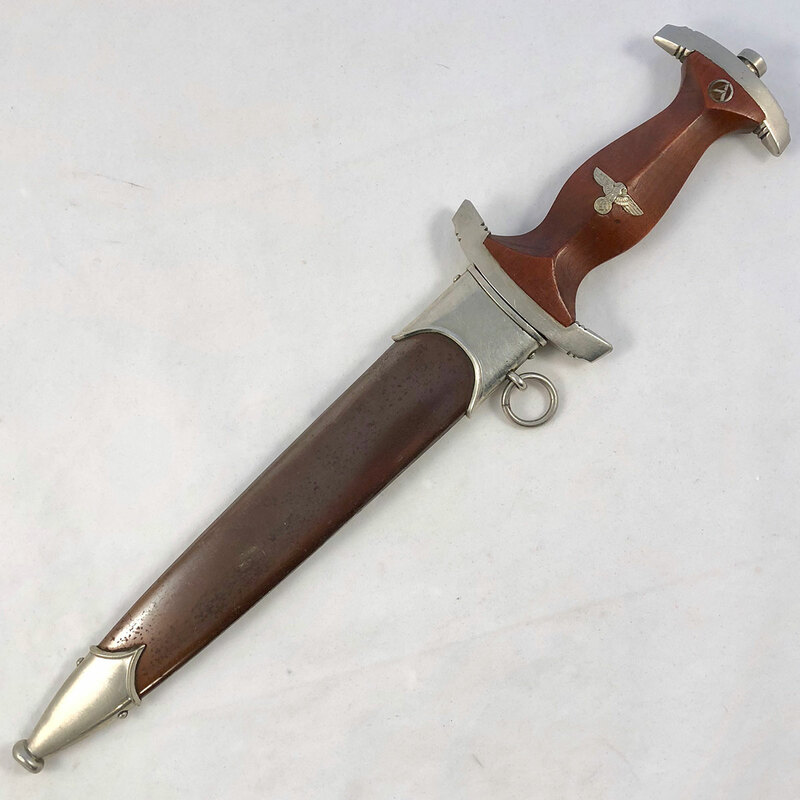 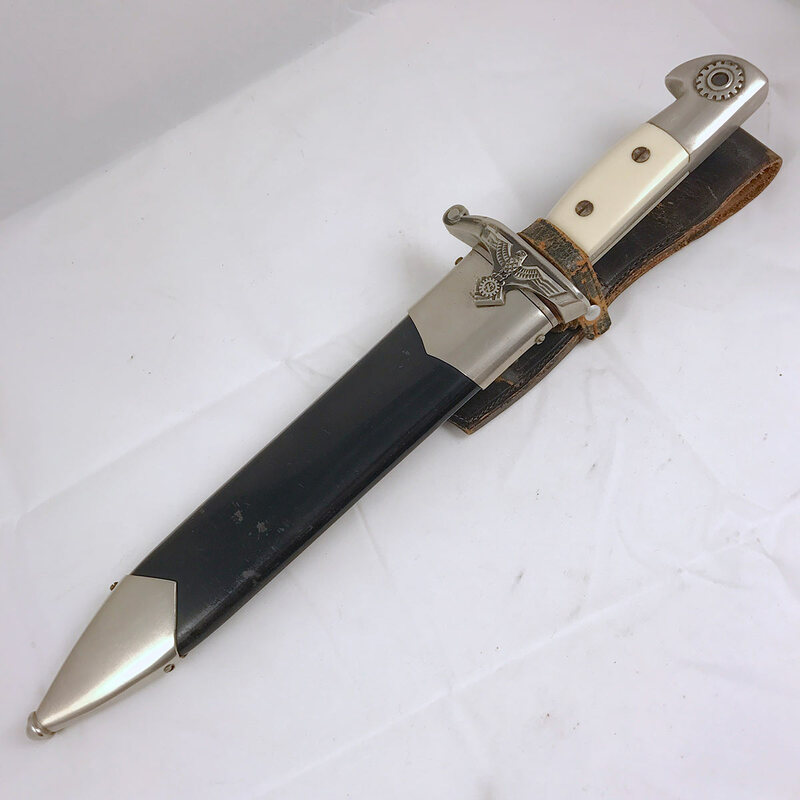 The throat fitting is missing the staple and will detach from the scabbard, so the new owner will want to fabricate a replacement staple, or simply remember to grip the fitting when removing the blade from the scabbard. 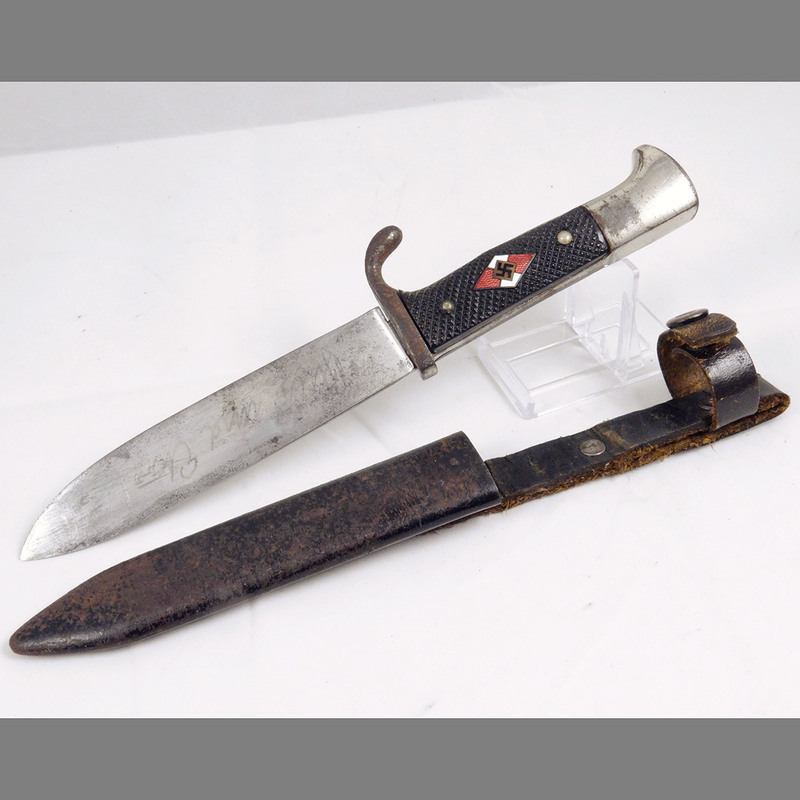 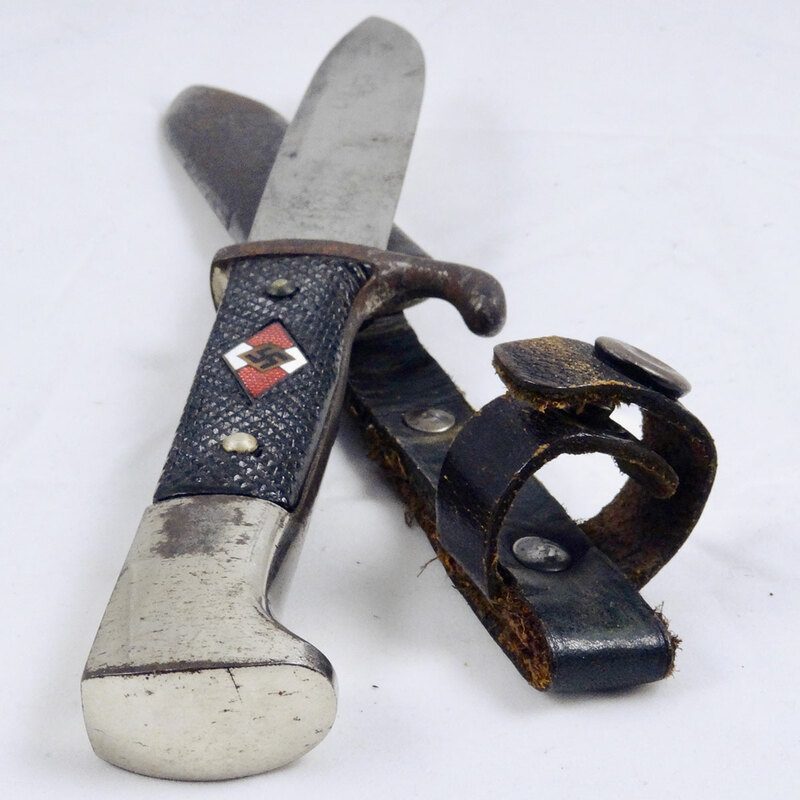 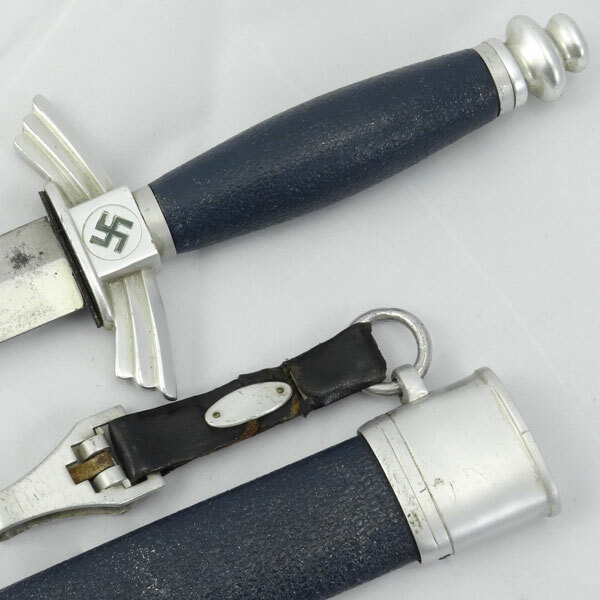 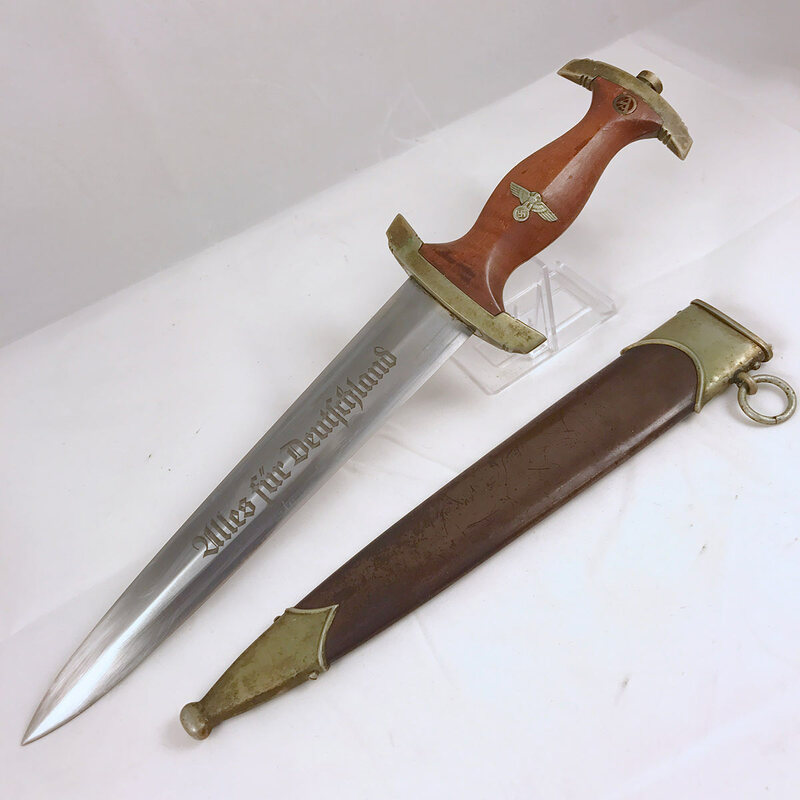 The original frog is also included with this Forestry Knife, and has what we assume is the original owner’s last name printed on the reverse.